Yakima, WA – Directors of Marketing Darrin Carpenter and Jay Dyer of Borton Fruit just returned from attending The Southern Exposer 2014 Food Show and Conference in Orlando this past weekend. This show is put on each year by the Southeast Produce Council. This was Borton’s 9th year attending the three day event including a golf tournament, Gala Opening Party, seminars, workshops, the show floor and a closing party. This year Southern Exposure reached record attendance, coming in just below 1,800 at 1,793 in total. Of the total number, they had their highest ever Retail and Foodservice attendance at 383. There were also 33 exhibit booths added to the floor-plan which has maxed out this location. Southern Exposure will remain in Orlando for 2015 with plans of moving venues in 2016. 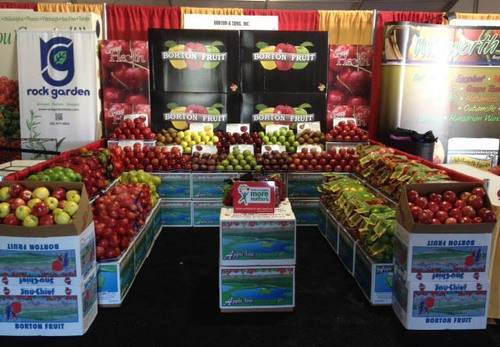 Merchandising in our booth consisted of numerous Apple Varieties, mostly premium 72s, 3# and 5# Soft Net Bags in numerous labels we offer as well as bulk pears, mostly 70s. We highlighted our Gator Bites bag for this show which markets healthy eating to children and drives consumption. 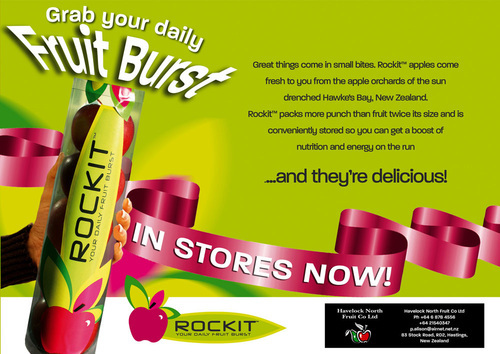 We also displayed a few Rockit tubes (photo seen below) that we are currently working on importing and marketing to Foodservice Providers as a healthy snack option. Some of our secondary display bins were displayed along with our POS varietal cards, both available upon request. “The overall show had very good, consistent traffic made up of key decision makers, VP’s, Directors, Buyers, Retailers and Foodservice providers. The relaxed setting allows quality time spent with current and potential new customers,” States Jay Dyer.